FLORIDA -- Thanks to a revolutionary procedure, a woman who had been blind for 16 years is now able to see. 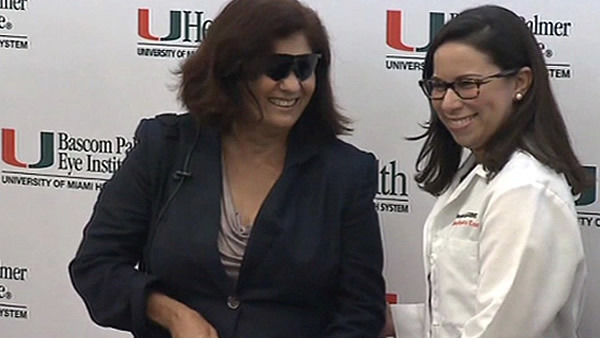 Carmen Torres, of South Florida, is the first recipient of a bionic eye. At 18, she was been diagnosed with retinitis pigmentosa, in which the vision declines over a period of time. "You have to move forward with your life," Torres, 45, said of her condition at a news conference Friday. Through an implant on the eye, the patient wears special glasses containing a video camera. An image is processed through a tiny computer affixed to a purse or belt. A signal is sent into the glasses that then transmits the image to the implant. According to Torres, she can now see sidewalks and buildings as well as find windows and doors. "It's very emotional," she told reporters. "But I am very strong and I didn't cry. I was happy and just laughing like crazy."